Today we discussed the myth of Theseus and the Minotaur. Students could see how King Minos not only tormented the Minotaur but likewise the Athenian tributes. They see the twisted nature of someone who forces the desperate Daedalus to use his inventive brilliance to develop a serpentine labyrinth to entrap and exploit the minotaur. They wondered about monstrosity and who was the beast : Theseus himself or the minotaur? Students considered whether heroes could exist without monsters. Do they define each other? 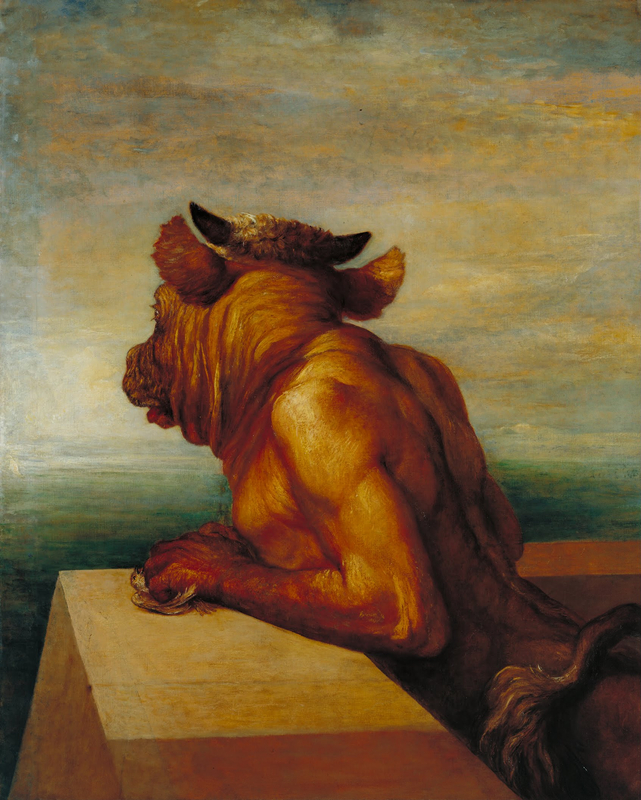 Many students saw the humanity in the minotaur (We had watched Jim Henson’s The Story Teller Greek Myths: Theseus and The Minotaur) and we considered Watt’s painting briefly. Both painting and video suggested the humanity within the beast, a duality to the nature of beast. Others saw how Theseus became the beast- glory seeking, focused on the completion of the quest, denying the humanity in the beast, denying another solution other than slaying. Many (the neophyte feminists) ‘read’ the tale considering Theseus’s treatment of Ariadne as appalling- hardly heroic or chivalrous merely ‘using and dumping’ as one student put it. Others in total opposition stated that despite the exploitation and oppression shown to the the beast, monstrous the Minotaur is. One boy claimed the minotaur was a killer which lurked in the dark corridors of the labyrinth and destroyed innocents. He argued that Theseus saved many by slaying this monster. Through the course of the discussion we investigated the word ‘monster’ from L. monere to warn, noting its early 14th century meaning of “malformed animal or human, creature afflicted with a birth defect,” and figuratively as “repulsive character, object of dread, awful deed, abomination”. We were interested too that the Latin word monstrum meant portent, omen or divine sign. We saw that in 1520s the meaning began to include a sense of vastness in size and in the 1550s the word was applied figuratively to people! However, we found ourselves caught in the labyrinth of Online Etymology Dictionary and Word Searcher as we tried to analyze the word into its respective morphemes and identify the base. One group felt it to be a free base while another group wondered about –er as a suffix therefore giving us <monstr+er> while others wanted to connect to monitor and admonish so suggested <mone +ster>. We then followed another twisting path to investigate the likelihood of the suffix -ster with students quickly citing trickster <trick+ster> , gangster <gang+ster> and prankster <prank+ster> as evidence. Our tentative hypothesis is the Latin root has led to two base elements: <mone> admonish, admonition and <monstr> demonstrate, remonstrate. As we looked for clues, I asked students to investigate the etymology of ‘clue’ itself. They were delighted by the way we use clue today in the metaphorical sense and saw how the word’s origin was entangled with the myth of Theseus through Ariadne’s ‘clew’. And of course all inevitably winds back to The Odyssey as we compared the two heroes and plot structure.. In the meantime … the latest batch of In Plain English:Tormented and the epic length Persecution. We thought some readers may enjoy watching the ‘how’ of these videos- showing how students collaborate to bring this to a screen near you!